Here I present a couple of ways to stop my HP laptop suddenly turning off when it's doing a lot of CPU-intensive work. It really is a shame that modern CPUs can't do their own power management so that they don't overheat and shut down without warning, but that's the way it goes. The problem has arisen as my laptop has gotten older, and its internal air cooling channels and fans have accumulated dust. Once the CPU starts doing some real work (like video processing or dealing with a runaway Flash plugin) the laptop fans kick in and the whole machine sounds like it's going to take off. After a couple of minutes of this, the fans lose the heat-removal battle and the CPU shuts down. Video processing with Microsoft Movie Maker is almost guaranteed to cause this horrible experience, so I need a solution! This software fix exists in Windows 7 (and probably all other modern OSes), and simply tells the OS to limit how hard it works the processor. 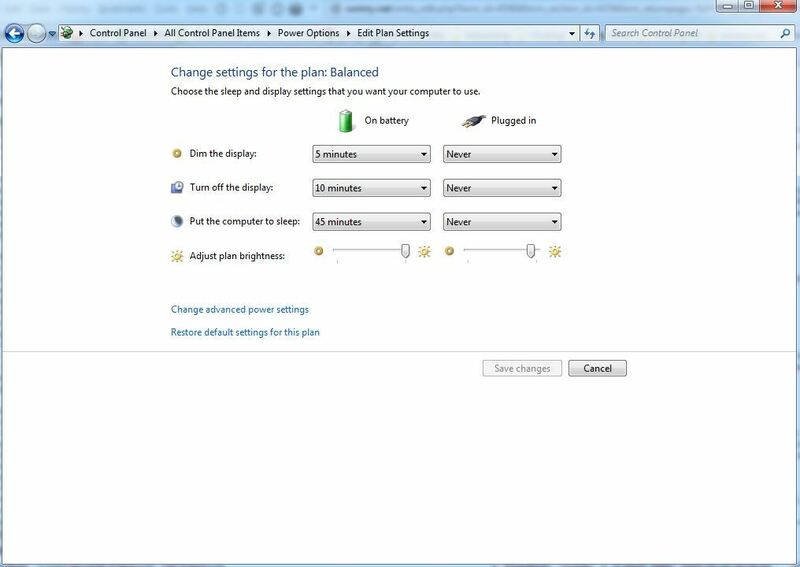 Click the Windows Start button, type power options, and select the Control Panel item of the same name (after a short delay whilst it searches). 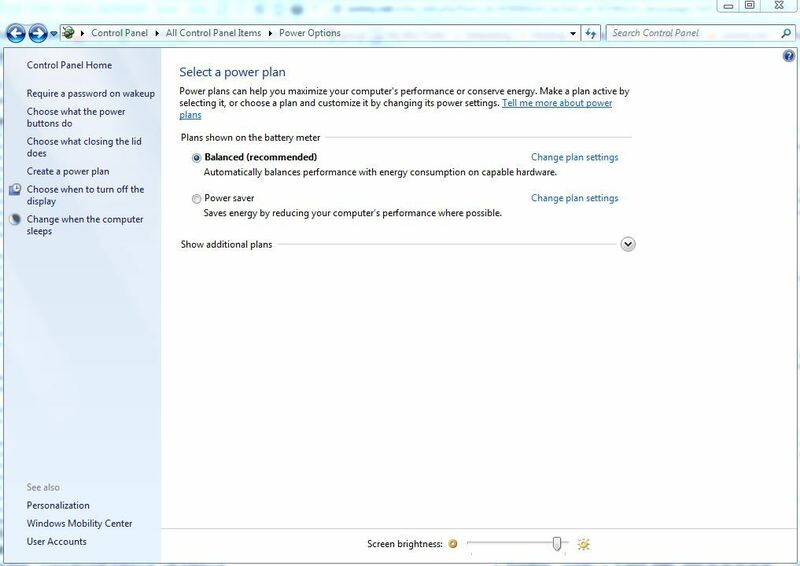 Click on Change Plan Settings next to the selected plan, then Change Advanced Power Settings. In the little dialog box that appears, scroll down the list to Processor Power Management and click on its + button to open it up. Click on the + button next to System Cooling Policy, and change it from Active to Passive. (This tells the OS to slow the processor before increasing fan speed.) Click the OK button to save your changes, and then simply close the control panel. HP has a detailed service manual for the Elitebook 8440p. Do a web search for file:HP-8440p-maintenance-guide.pdf, and select the top PDF result from one of the hp.com websites, eg, http://h10032.www1.hp.com/ctg/Manual/c02745864.pdf. Important sections for the cleaning process are 4-1: Preliminary replacement requirements; 4-35: Fan and heat sink. I wouldn't remove the heat sink; the only objective here is to clean the fan and clear out the airways. Two important points here: ONE I haven't done this myself, so can't say how straightforward any of this is; TWO You do all of this at your own risk, and please don't even start taking your laptop apart if you aren't sure what you're doing. Thanks John, I have been searching for a solution to my old HP elitebook 8540W unexpecting shutting down. so followed your instructions So far so good, watched utube video, the fan noise has greatly reduced and no unexpected shutdown. That's great, glad it helped! Thanks,I really appreciate this because am facing same challenges now.. Thanks, I'll try the prescribed steps and get back to you.